Known for thousands of years but still active, threatening and affecting two billion people in the world, Paludism or Malaria is a fearsome epidemic of which the agent and mode of propagation are already known at the end of the 19th century. Spread over different continents, the physicians of the Colonial Health Service study the epidemiological forms and the geographical distribution of the disease. They also help in the work of classifying and understanding the clinical presentations, among which there is the fearsome biliary haemoglobinuric fever. 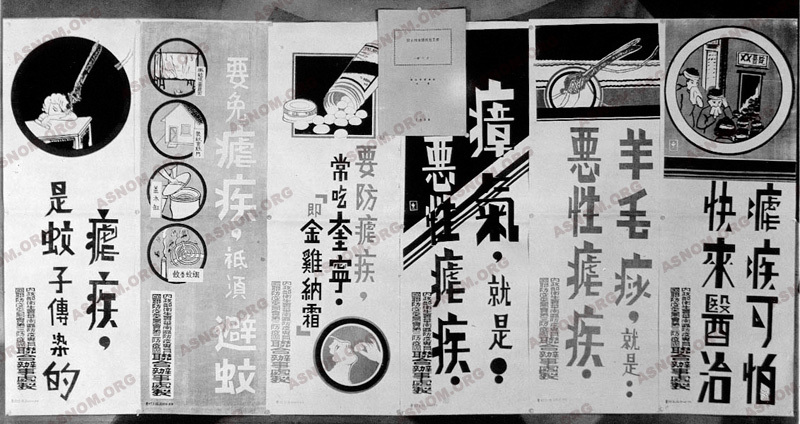 The therapeutic effects of quinine are strengthened in 1930 with the appearance of synthetic antimalarial products. Moreover, in order not to be dependant on South American production, Yersin* develops the cultivation of cinchona in Indonesia. The Colonial Health Service is also concerned with the prevention of the greatest of tropical endemics. It does an epidemiological study which leads to health campaigns, completed with campaigns of prevention. The WHO, from the time of its foundation in 1948, launches an attempt to eradicate the disease with the aid of the SGHMP and then, after Independence, with the aid of national organizations. The utopian nature of this project becomes evident in 1969. "Intermittent fevers" are known from time immemorial. They are mentioned by Homer and studied by Hippocrates. 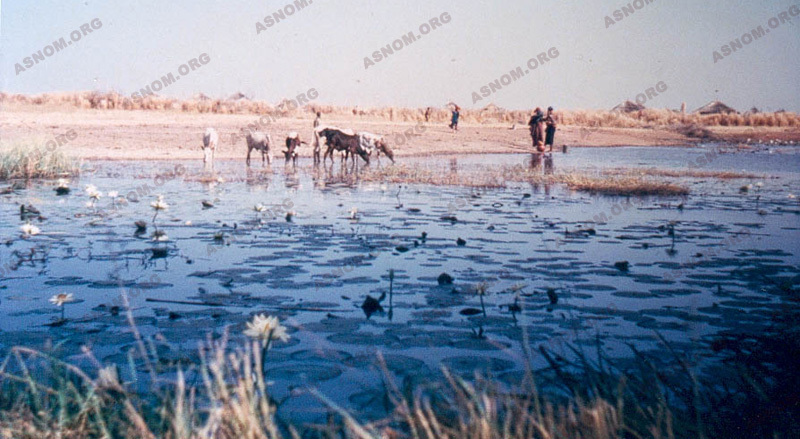 Their predilection for marshy regions results in the disease being known very early as "Marsh fever" or paludism. Contamination being attributed to "bad air", other authors use the name "Malaria". Until the 19th Century, this theory of "morbid miasmas" is the one that prevails to explain the transmission of malaria. 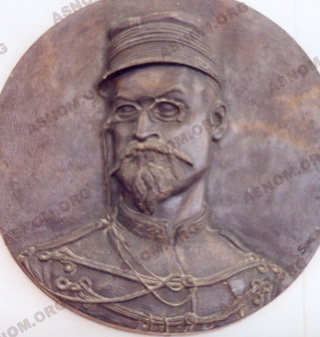 - 1880 : Laveran, a French military physician and a student of Pasteur, discovers the agent of malaria in Constantine. In 1907 he receives the Nobel Prize for Medicine. 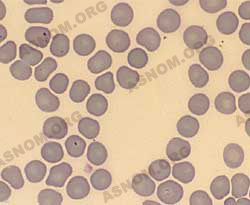 Later, four species of human haematozoon or Plasmodium are identified : Plasmodium falciparum, the most widespread and the most dangerous, which kills (a million deaths a year in the world), Plasmodium vivax, Plasmodium malariae, and Plasmodium ovale. It must be mentioned that, in nature, other haematozoon affect animals but cannot be transmitted to humans. - 1897 : Ross, an English physician in the Indian Army, demonstrates that the transmission of bird paludism takes place through mosquitoes. A little later, in 1898, Grassi and other Italian authors and then Manson confirm that it is the same for human paludism, which is transmitted by female mosquitoes (anopheles). Ross receives the Nobel prize in 1902. This "anopheline theory" is verified in Madagascar between 1902 and 1904 by Clarac* and Bouet* : They observe that the frequency and the gravity of the malaria is proportional to the dispersion and proliferation of mosquitoes and that the destruction of mosquito breeding grounds reduces considerably the spread of the disease. The female mosquito operates nocturnally and the stings are painless. The bloody meal it looks for is indispensable for procreation. The reservoir of the virus is exclusively human. Within the body of the mosquito and then within that of man, the parasite goes through a complex cycle of development with a dozen successive stages. The parasite, inoculated by the sting, reaches the liver and multiplies there. After a few days, it gets into the blood and invades the red corpuscles. Another female mosquito, at mealtimes, absorbs parasites from humans and contaminates itself. The man-mosquito cycle is thus continued. There are many species of anopheles. 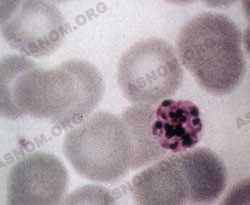 They do not all have the same appetite for human blood and so not the same role in the transmission of the haematozoon. Even more important is the fact that the "dangerous" species do not all have the same habits. Thus, to put in place an efficient plan of prevention, a perfect knowledge of these species is necessary. This analysis was the work of the "pioneers" of the Colonial Health Service, those who were followers of Pasteur, doctors or chemists who were entomologists. The list of those who participated in drawing up this inventory would be long. "It struck me like a bolt of lightening... I felt frozen to the marrow... I start to shiver uncontrollably. Malaria ! And then I feel that I'm getting warmer... It seems to me that I am inside a furnace. My temperature is 40.5°; my skull is about to burst... I begin to be delirious... The nurse gives me an injection of quinoforme. In the morning, I have returned to normal... My bed had been flooded with sweat and my attendants had changed my clothes without my being aware". These "torments of malaria" described by a physician, Bonnefond*, have been the experience of all the settlers. One of the first scientific studies in sub-Saharan Africa is the work of Marchoux* accomplished in St Louis, Senegal. In three years, starting with 350 observations of patients and thanks to a personal method of staining the parasite, he completes the study of the evolutionary stages of the haematozoon and, after autopsies, he describes the engorgement of cerebral capillaries in patients who have died of pernicious fits. The work of colonial physicians, Thiroux* and Marcel Leger* in Senegal, Bouffard* in Sudan and Sorel* in the Ivory Coast, has largely contributed to the knowledge of the disease. Besides the typical feverish fits that occur every two days (tertian fever) or every three days (quartan fever), the acute manifestations may consist of a continuous fever having the appearance of typhoid fever, particularly in Indochina, where Grall* speaks of malarial typhoid. Only intermittent fevers are affirmed to be authentic malarial manifestations. From 1834, Maillot*, who obviously ignored the cause of the disease, already believed that all fevers were malarial because they were cured with the administration of quinine. As F. Blanc* insists, malaria is more frequent after a short stay than during long sojourns and the forms are then more serious, which makes Moretin* remark: "little stay - big malaria". In fact, the force of the parasitic invasion in the case of young subjects arriving in endemic zones brings about what Le Dantec* calls "ship's boy malaria", which often evolves into a serious form of the disease. Around 1950 F. Blanc sets about clarifying the different clinical presentations of chronic manifestations, with low fever and the wasting away of the subject who becomes anorexic, anaemic, acquires a grey complexion, which leads to the malarial marasmus described by Quennec* at Nossi-Bé after the events in Madagascar in 1895. Sometimes, usually after high fever, neuralgic manifestations appear, giving rise to an aspect of febrile coma with convulsions. This is the most brutally destructive form of encephalitis, says Collomb*, affecting mostly young native children and Europeans who have arrived recently and have not received or been badly treated with secondary chemoprophylaxis. Death follows in a few hours or a few days, in spite of the treatment administrated. The manifestations of the disease already described by Laveran in 1907 in his treatise on Malaria have been studied once again, while according great precision and taking into account new data, by Grall* and Clarac* in 1910, Le Dantec* in 1929, Joyeux* and Sice* in 1936. Sometimes, in the case of a European, a long-time resident, taking irregular doses of quinine (more rarely in the case of natives) a very serious condition known as "biliary haemoglobinuric fever", which is found all over the empire, suddenly develops. This condition is characterized by high fever, a sallow complexion, cherry-red urine the colour of port wine, almost black, due to the haemoglobin it contains. Urinary secretion slows down and, in one-third of the cases, the patient dies of uraemia. This dramatic circumstance is described in the 19th Century by the naval physicians Lebeau, Dolle, Le Roy de Méricourt, Beranger-Ferraud. As early as 1900, Marchoux* attributes it to the administration of quinine. Later the patients themselves become aware of the link with quinine and refuse this remedy. Today one knows that this condition is the consequence of the sudden bursting of red corpuscles, resulting in the release of haemoglobin into the vessels, depending on individual sensitivity to quinine. When quinine was no longer used therapeutically, the condition was no longer observed. In the 17th Century, cinchona bark, used by indigenous people as a remedy against the fevers of the region, is brought from Peru to Spain. In 1820 the French chemists Pelletier and Caventou isolate the active element, an alkaloid called quinine, which revolutionizes the prognosis of the disease. During the conquest of Algeria, the French military physician Maillot - who has already used quinine in Corsica - is appointed to the hospital in Bône where the death rate of fever patients was nearly 25 %. He uses the new medicine liberally and his success is such that all the patients demand admittance to his ward "where one dies so little". 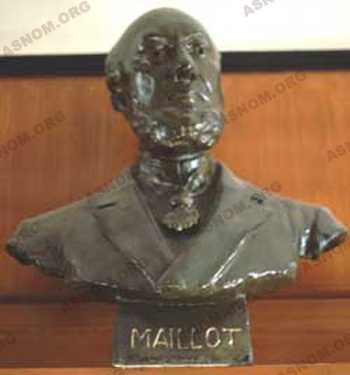 Maillot determines precisely the patterns curable with quinine; but he is also the initiator of secondary chemoprophylaxis, with the taking of daily doses of this remedy. For a century, from the time of Maillot to the 1930s, quinine salts are the only anti-malarial products used. Presented as a medicine to be taken orally (as pills or syrups for children) and as injectable solutions in ampules, they fulfil all that is required of a curative as well as a preventive remedy. Towards 1930, efficacious synthetic products appear having a common advantage of being less costly and having a persistent effect in prophylaxis, which permits medicines to be taken no longer daily but weekly. The inconvenience of all these products is that strains of bacteria which resist treatment appear rapidly. To study the limits and intensity of an epidemic in a given zone, it is necessary to depend on quantitative data and choose the indicators that are the easiest to measure and the most reliable. Determining the state of the spleen is a rapid and low-cost method of obtaining a view of the present malarial condition of the patient. It gives an indication, in children less than fifteen years old, of the frequency of the increase in volume of the spleen. Normally this organ is not palpable under the left edge of the ribs. Its volume is increased when malaria sets in and will be increased with each attack until it can be felt by palpating the edge of the ribs; it may reach the umbilicus and sometimes go beyond it. The percentage of enlarged spleens permits the establishment of the spleen-condition of a population of children. It is easy to determine because it only requires palpation of the abdomen. It has been widely used by epidemiologists, even if it is less reliable than other methods based on parasite research by examining a drop of blood through a microscope. Taking blood samples is not well-accepted by the population. Performed simultaneously, the two methods have evolved together. Farinaud* shows that in countries where the endemic exists, 96 % of the children are infected with parasites at the end of their first year. The size of their spleens increases rapidly and reaches a maximum between the ages of two and five. (Meanwhile, from 20 to 40 % of them will be dead). From then on, a stable condition seems to subsist but it is only at the age of puberty that the individual acquires sufficient immunity to resist infection. 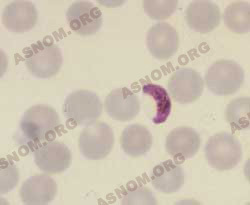 The large spleens become smaller and almost normal, although the adult himself remains throughout his life more or less under the influence of malaria. His powers of resistance may be overwhelmed in the case of intercurrent diseases or due to usual factors that lead to the diminution of the resistance of the organism. It is thus that the number of patients increase when there is a temporary shortage of food. Women often experience a reawakening of latent malaria during pregnancy and childbirth. In Indochina, from 1919, Noël Bernard* studies the rate of infection in Indochinese labourers. The investigation is extended into the whole of the Indochinese union. In 1929 the "Anti-malarial Service" is established and directed by Morin*. Its success is dazzling. 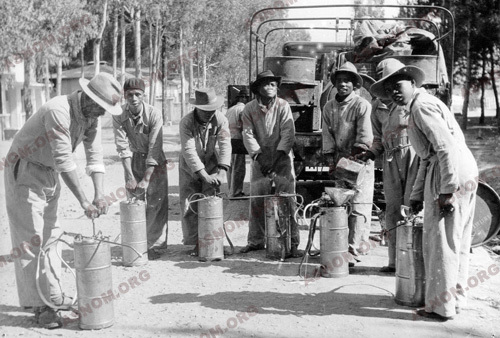 Workers in plantations and mines are protected. L.A. Robin*, Marneffe* and Farinaud* distinguish themselves particularly during these campaigns. It is the most widespread disease in the world, causing every year nearly two million deaths of which more than a million are those of children. 40 % of the world's population live in malarial zones. Its economic cost is estimated to grow by 1.3 % every year. At the peak of the French Colonial Empire, Vogel*and Riou*, the authors of an annual report established by the Direction of the Colonial Health Service, declare that in 1937 : "Malaria remains, as always, for the whole of our colonies, the most fearsome epidemic". - In the whole of Indochina, the disease is the cause of 20 % of the consultations and 16 % of the hospitalizations. Its widespread character and its severity justify the creation in Annam and Tonkin of an "anti-malarial service" made responsible for searching people suffering from the disease and pursuing anti-malarial investigations. - In Madagascar, the disease is the cause of 27 % of the consultations and 16% of the hospitalizations. - In the AEF, with only 3.6 % of the population arriving for consultations, one begins to think that the disease is less prevalent. In fact, numerous investigations in the area reveal a higher rate of infection : thus, in the Mid-Congo (Moyen-Congo), in the department of Pool, the Pasteur Institute of Brazzaville finds, during that same year, in the villages, blood rates (said to be due to plasmodium) between 45 % and 100 %, the average in the region being 75 %, which corresponds to a strong hyperendemic situation. - In the AOF, systematic investigations made in Guinea establish the figure for affected spleens as 80 %. - In the group West Indies-Guyana, the disease rages more actively on the continent, in Guyana, where a large proportion of the patients are Europeans in penitentiary establishments. - In India, only Chandernagor is concerned, the disease being rare in the other trading posts. - In the Pacific, Malaria exists neither in New Caledonia nor in Polynesia while it is hyperendemic in the New Hebrides. On the whole, one estimates that many millions of Malaria patients are treated every year in establishments of the French Colonial Health Service. 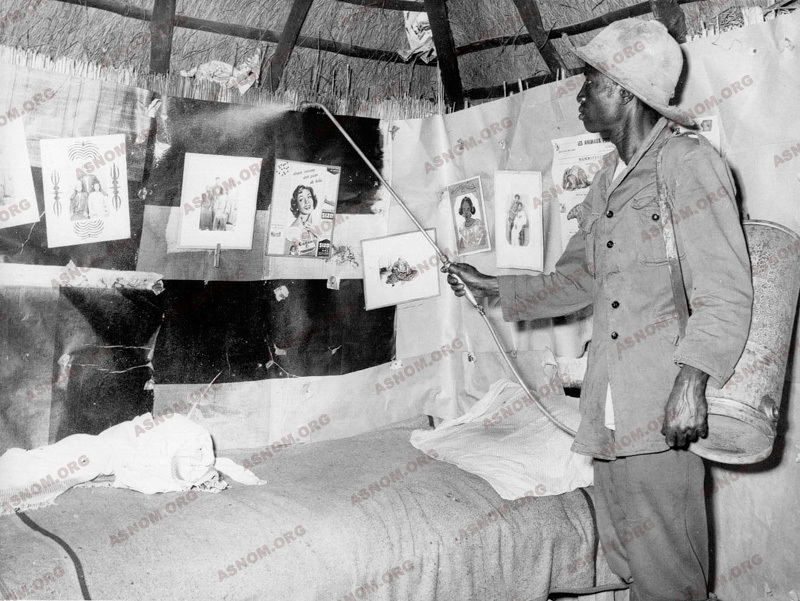 At the time of Independence in 1960, Malaria is clearly on the decline. Until 1948, outside Indochina, there is no "Native Health Service" to combat Malaria for the indigenous people. It is integrated in the polyvalence of the AMI. All the patients are treated one by one in the dispensary or admitted into hospital. In general, those who have fever are given quinine systematically, later quinacrine and then chloroquine. Before the term is invented, it is what will later be called "presumptive treatment". They are preceded by an epidemiological investigation to evaluate the intensity of the epidemic by establishing the condition of the spleen in the case of children and adolescents. They are examined in some villages by the bush doctor and systematically in schools. Moreover, the Hygiene Service and the Pasteur Institute try to identify local mosquitoes and their habits. From 1948, confided to the SGHMP, the mass anti-malarial combat takes on another dimension. As early as 1903, Rangé*, the inspector of Health Services in the AOF recommends the suppression of larvae breeding grounds, and the elimination of stagnant water spots is organized by the hygienic services directed by a colonial physician that the populations nickname "Mosquito Doctor". One of them, at the end of his career as a hygienist, knew how to find motionless mosquitoes in the most unlikely hiding places. His African collaborators said of him: "He has learnt to reason like the mosquitoes !". - The drying up of larvae breeding grounds. - The installation of earthenware or concrete draining material, water-flowing facilities in river networks, in Indonesia from the 1930s (Pleiku, Phu Qui) then in Madagascar (Ivato in 1937). - The spreading of fuel (which asphyxiates larvae) over shallow waters that cannot be drained away. Around Dakar, attention is paid to market-garden and garden wells and to creeks, which are sprayed with mineral oils derived from petrol. - The introduction of larvae-eating fish of the species Gambusia or Girardinus into ponds and water spots where anopheles foregather. - Visits made by "the brigades of the hygiene service" to houses with the possibility of fines if larvae-breeding places are discovered. 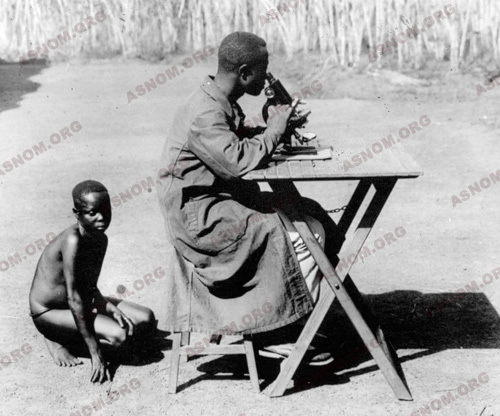 For example, in 1937, in Dahomey: 270 158 visits lead to the discovery of 3 436 breeding places of anopheles. - The spraying of the walls of houses with insecticides, pyrethine and other "fly-tox". - The use of mosquito nets at night, the installation of metallic wire mesh on windows or the application of Citronella, palm oil, etc..., on the skin, protects one from mosquito bites. - Certain indigenous practices prove to be efficacious. Thus Bouet* in 1903 advises "that the Malagasy custom of living in huts filled with smoke from the kitchen fireplace should be allowed to continue and the native should not be obliged to build a kitchen outside his dwelling". 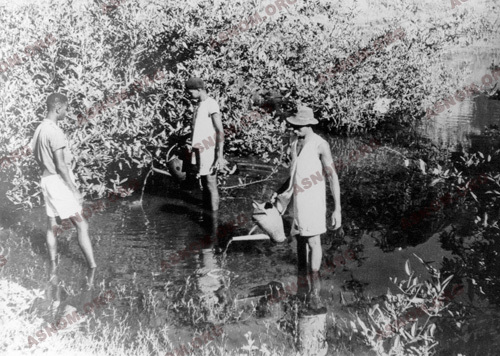 In Madagascar, from 1902 to 1904, under the authority of Clarac*, the natives are advised not to fill paddy fields with stagnant water after the harvest but to let them dry up. In sub-Saharan Africa, the combat is led all the more vigorously as the Health Service is, at the same time, active against the Aedes, the vector of Yellow Fever. His mosquito control programme is adopted in the other capitals. His career will be short: he dies in 1908 in Kindia (Guinea) at the age of 32. His statue, paid for by public contributions, is inaugurated in 1914 in Conakry where his memory remains legendary. 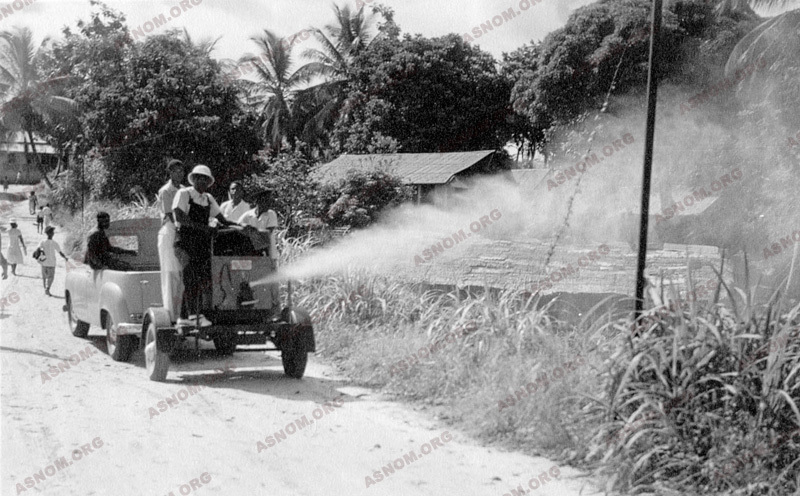 After the Second World War, the advent of DDT, the first of the organo-chlorates, insecticides with residual effects, marks a decisive step in the anti-vectorial combat, at least in urban areas. It is used in the form of pulverisations, in dwellings and in hedges and foliages along public roads. Two inconvenient factors soon appear: on the one hand, the high cost of these pulverisations; on the other hand, from 1956, the appearance of species of anopheles that can resist these products. From 1840, Maillot advocates taking quinine to avoid malarial manifestations. In 1893, the Dahomey expedition is a great success on the level of health, the troops having observed the recommendations. In 1895, the Madagascar expedition is a disaster because the hygienic recommendations and the rules for protection were completely unsuitable. Le Dantec* writes in 1929 : "that generally 20 or 30 cg of quinine sulphate are taken every day for many successive years without any trouble. The prescription must indicate a daily dose and not a weekly one as it sometimes does". Chemoprophylaxis does not concern adult natives, considered as semi-immunised after adolescence. The programme is designed to protect Europeans systematically, civil servants and native children thanks to the free distribution of quinine and, later, chloroquine. In the 1930s, synthetic antimalarial products taken weekly as prophylactic doses are widely used. The results prove to be satisfactory notably in 1937 in Chad, Madagascar, Cochin China and in Annam. There is significant reduction in the size of spleens. In Togo, in Sokodé, the comparison between areas that have dispensaries and those that do not shows that the former have 26 % bad spleen conditions and the latter double that figure, that is to say, 52 %. As soon as it is discovered, chloroquine supplants other products rapidly. In 1948, a great chemoprophylaxis campaign aimed at civil populations is set up in Indochina, in the mountain plateaux in the centre. Directed by Choumara*, "an autonomous mobile service of antimalarial prophylaxis" is created. At the end of 18 months, three protocols, when compared, show equivalent results. The infant mortality rate is reduced by half. 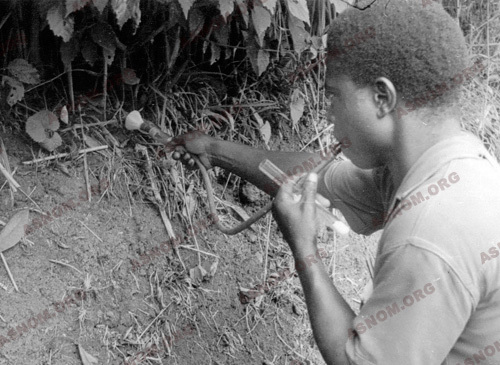 The populations prefer the spraying of DDT (every six months) to the daily distribution of chloroquine. Other protocols are tested by Farinaud* and Choumara* until 1953. At the end of these five years of study, it is confirmed that the best prophylaxis consists of an association of the combat against vectors with chemoprophylaxis. 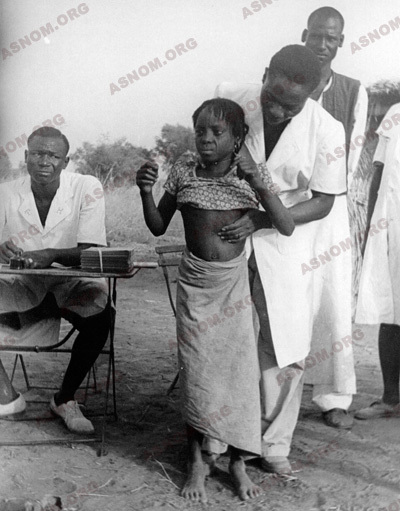 Leaning essentially on the combat against vectors, the WHO and international organizations decide in 1956 to attempt to eradicate Malaria in the world. Experimental zones are designated in order to test methods and evaluate the results. The SGHMP has had a "Malaria section" since 1948 and two "experimental zones" are chosen by the WHO in French West Africa (AOF), one in Senegal, in Thiès, which is put in charge of R. Michel*, the other in Upper Volta, in Bobo-Dioulasso, confided to Ricossé*. Divided into sectors, these zones are submitted to different protocols, the combat against vectors with DDT being used alone or in association with chemoprophylaxis. Although the epidemic has diminished significantly after five years of the programme, chemoresistance spoils hopes of progress : that of anopheles vis-à-vis insecticides (Hamon and Choumara* in Upper Volta in 1957) and that of haematozoon vis-à-vis chloroquine in 1960 (Ricossé*). Once it becomes independent, Senegal decides to preserve the experimental zone of Thiès by creating an "Antimalarial Service" (SLAP) which continues to be directed by Michel* and is integrated on the regional level into the OCCGE. Because of its cost, the spraying of insecticides is reduced, whereas health education and chemoprophylaxis are given greater importance. The results remain very satisfactory : serious Malaria disappears and children are in better health. In 1969, the WHO acknowledges officially the failure of the project to eradicate Malaria from the planet. 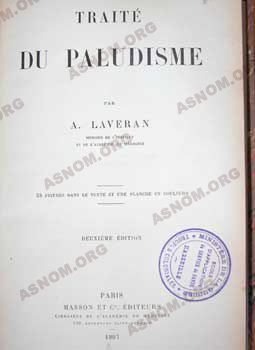 - Laveran A. : Traité du paludisme. 1 vol. 622p. Masson et Cie Edit. Paris 1907. - Joyeux Ch. Sicé A. : Le paludisme.p.779-889, In Précis de médecine coloniale. Masson et Cie Edit. Paris 1937. - Vaucel M. : Paludisme. p.655-806, in Médecine Tropicale. Editions médicales Flammarion. Paris 1952. - Groupe d'auteurs : Le paludisme. Méd. Trop. 1982,42,363-462. - Groupe d'auteurs : Le paludisme. Rev. Prat. 1988,38,18,1149-1187. - Groupe d'auteurs : Le paludisme. Rev. Prat.1998,48,3,251-297.